The Buddy Bench is a tool designed to educate and eliminate loneliness and promote friendships on the playground. The blue Buddy Bench by Paris Site Furnishings is constructed of heavy-duty steel consisting of 1.5 in. x 1.5 in. structural tube ends with 14-Gauge steel seats and backs. The bench ends, seat and back are sandblasted prior to an e-coat surface treatment finished off with a premium powder coat paint finish. The bench comes with pre-drilled footplates that easily mount with the included concrete stud anchors. When properly installed the bench will remain stable and secure, avoiding tipping and theft. The blue Buddy Bench will provide a comfortable and safe environment for children and compliment any playground. 68 Gal. Metal Animal Proof Trash Can in Green The Buddy Bench is a tool designed to educate and eliminate loneliness and promote friendships on the playground. The blue Buddy Bench by Paris Site Furnishings is constructed of heavy-duty steel consisting of 1.5 in. x 1.5 in. structural tube ends with 14-Gauge steel seats and backs. The bench ends, seat and back are sandblasted prior to an e-coat surface treatment finished off with a premium powder coat paint finish. The bench comes with pre-drilled footplates that easily mount with the included concrete stud anchors. When properly installed the bench will remain stable and secure, avoiding tipping and theft. The blue Buddy Bench will provide a comfortable and safe environment for children and compliment any playground. 68 Gal. 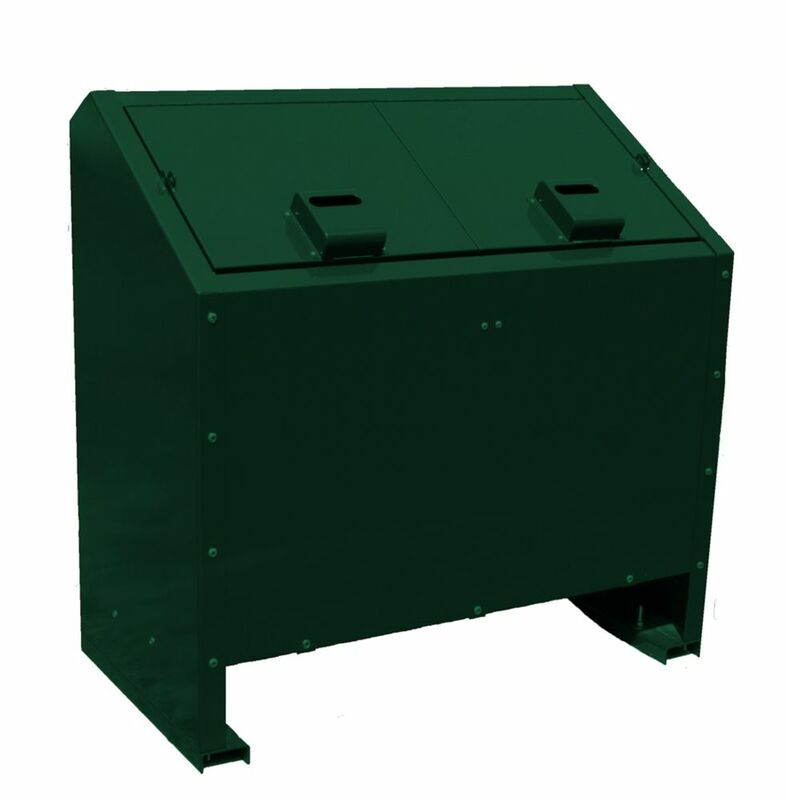 Metal Animal Proof Trash Can in Green is rated 4.5 out of 5 by 2. Rated 4 out of 5 by Kristen from Upon initial inspection, everything seems to be in order. ... Upon initial inspection, everything seems to be in order. Looks like it will be fit my needs and do its job. But you should probably ask customers 1 year after the purchase to learn if it was able to deter critters. I like the design in that critters can't get on top of it and remain for too long...and that it sheds snow and water. The unit seemed well balanced and the doors opened easily. I am a little concerned that there is a bit too much "give" or "play" in the rear doors and that a bear could get its nails in that opening...even though its locking mechanisms will likely prevent it from being pried if an animal is that determined. I have a lot of black bears in my area and need to secure my trash since there is no city trash service at my remote location. I am hoping this unit retains its nice appearance and security for a very long time. Rated 5 out of 5 by Diane from We love our Paris 68 gal. Metal Animal Trash Can!... We love our Paris 68 gal. Metal Animal Trash Can!